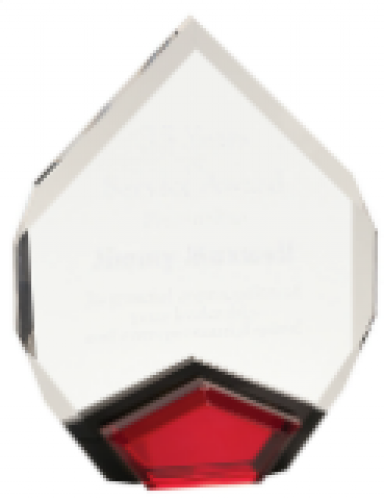 This elegant clear acrylic award features a black and red base to add pizzazz. Available in two sizes, engraved areas are frosted white against a clear background. Includes 50 words laser engraved or logo + 25 words. 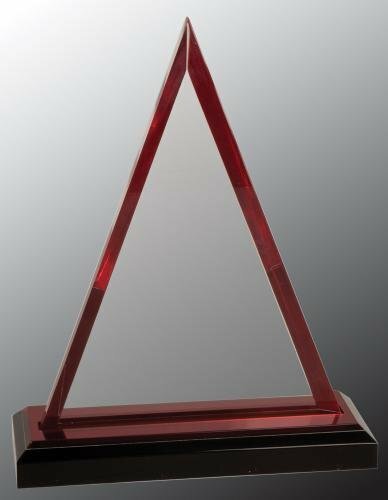 This uniquely colored acrylic award reflects red up from its black base creating a distinct appearance. Available in two sizes, engraved areas are frosted white against a clear background. Includes 50 words laser engraved or logo + 25 words. 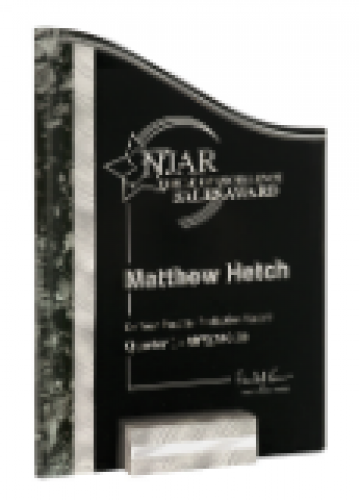 This unique acrylic award features a stylized colored background with silver aluminum base. Available in two sizes and a large surface area for engraving, with engraved areas appearing frosted white against the dark background. Made in the USA. Includes 50 words laser engraved or logo + 25 words. 5" x 8" x 1.25"
7" x 10" x 1.25"
This clear acrylic award features a blue metallic arching star and comes in three sizes with a large surface area for engraving, making it a functional and popular item. This acrylic award is thick enough that it stands on its own without a base. Includes 50 words laser engraved or logo + 25 words. 7' x 4" x 1"
This clear acrylic award features a bronze metallic arching star and comes in three sizes with a large surface area for engraving, making it a functional and popular item. This acrylic award is thick enough that it stands on its own without a base. Includes 50 words laser engraved or logo + 25 words. This clear acrylic award features a gold metallic arching star and comes in three sizes with a large surface area for engraving, making it a functional and popular item. This acrylic award is thick enough that it stands on its own without a base. Includes 50 words laser engraved or logo + 25 words. This clear acrylic award features a silver metallic arching star and comes in three sizes with a large surface area for engraving, making it a functional and popular item. This acrylic award is thick enough that it stands on its own without a base. Includes 50 words laser engraved or logo + 25 words.